Propolis is well known for its potential applications but also for its chemical complexity, making it very hard to define quality standards for its commercialization. Every day it is possible to find new publications on this bee product describing a new singularity, a particular substance with high bioactivity never described or a new application. This systematic increment in scientific information, although relevant, do not always enable a clear comparison between samples due to the different methods and procedures used to assess its quality parameters. To strength the scientific studies on propolis and establish a background for future definition of standards for industry, producers and laboratories, the Propolis Working group of the International Honey Commission, performed an inter-laboratory study to harmonize basic analytical methods and evaluate their accuracy and robustness. The collaborative study was accomplished by 12 laboratories from 9 countries and a company experienced in propolis trade. The samples under analysis, representing fifteen different origins around the globe, where fractionated and distributed to each laboratory, and so all participants analysed the same material. Overall, six parameters were evaluated: ashes, wax and balsamic extract on raw propolis, and total-phenolics, flavones and flavanones on propolis extract. The results were analysed following the international guidelines ISO 57251. Outliers were removed using Cochran’s test, to check the homogeneity of variances at certain levels, and Grubb test’s, to check the consistency of the laboratories average. The results revealed good reproducibility for ash, wax, balsamic content and flavones, while for flavanones the method is clearly unsuitable. ISNAD LOPES, M. , PEREYRA, A. , KUNERT, C. , BECKH, G. , SCHREITER, H. , ÇELEMLI, O. G. , SORKUN, K. , GEORGÉ, S , PAULO, L. , GARDINI, S. , SANCHO, M.T , BANKOVA, V. , DASTAN, T. , TANANAKI, C. , NUNES, L.F. , VILAS-BOAS, M. . "A Collaborative Study for Performance Evaluation of Analytical Methods for Propolis. An IHC Trial". 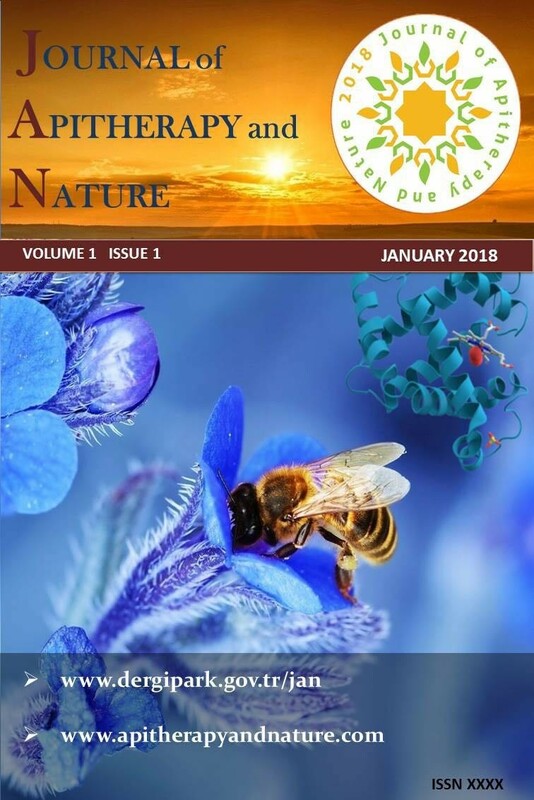 Journal of Apitherapy and Nature 1 / 3 (December 2018): 21-21.